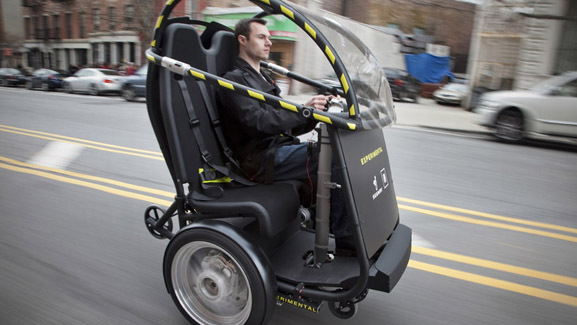 Urban Mobility & Accessibility - prototype. As you can see, it's essentially a 2 person Segway that goes further (up to 35 miles) and faster (up to 35mph). You can also see it's not the most attractive or weatherproof thing, but that's not surprising given it's only a prototype at the moment. ... ideally its total operating cost - including purchase price, insurance, maintenance and fuel - would total between one-fourth and one-third of that of the average traditional vehicle. An "average traditional vehicle" in who's mind? Remember GM are responsible for the Hummer. Given GM's recent financial woes, it'll be interesting to see if this ever reaches the market, if it's approved "road legal" by countries like the UK and just how expensive it'll be.